FULTON, NY – The Oswego County Autism Task Force is currently seeking nominations for the 2011 “Friends of Autism” Award. 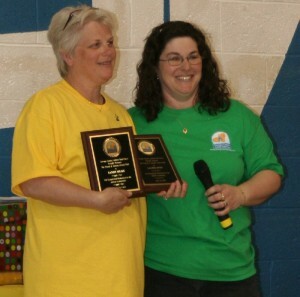 Pictured is Theresa Familo, right, of OCATF presenting the 2010 award to Sue Squires. Squires is accepting the award for Sandy Silky and Laurie Doss who were not able to be present. The recipient who is selected must be an Oswego County community member who lives or works in the county who has championed the cause of autism in their community. The winner may be an individual or a group and/or agency and cannot be a current OCATF member. All nominations can be sent to Theresa Familo at Parents of Special Children Inc., 2 C Tower Drive, Fulton, NY 13069 before the March 16 deadline. The winner will be announced at the Annual Family Fun Walk for Autism, April 30. For more information about the “Friends of Autism” Award or about OCATF, call 349-3510.